According to the German Federal Statistical Office, nine out of ten employees in Germany receive a refund when they submit their annual tax return. 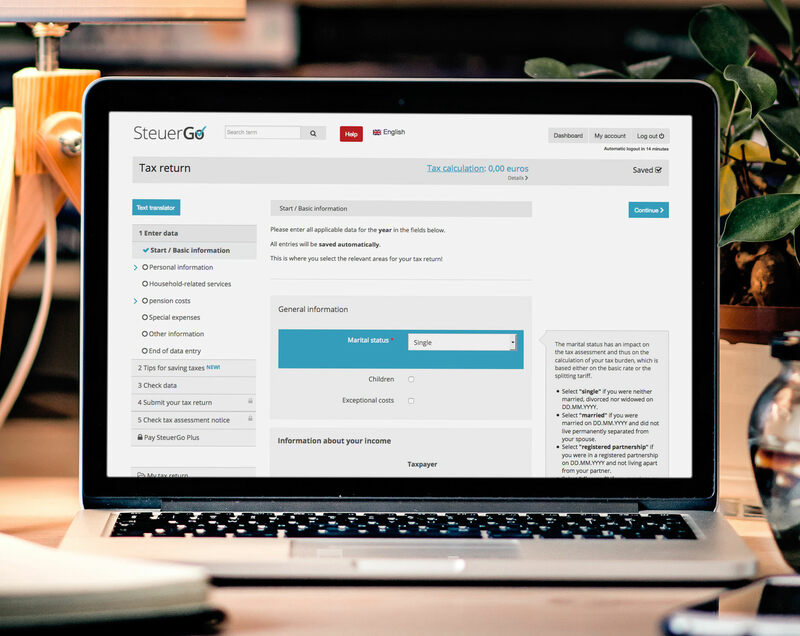 Users of SteuerGo.de have had an average refund of around 1100 euros due to our customised tax-saving tips. Your tax return can take less than an hour to complete with SteuerGo.de. In following years, it is even easier and quicker due to the automatic transfer of entries. SteuerGo.de is ideal for employees and freelancers working in Germany, especially if it's your first tax return. You are safely guided step-by-step through a clearly structured interface. Any entries you make are automatically saved in your free account. It is all in English, every step of the process. Many explanatory texts help you to understand what is needed and key German terms are given in brackets to help you navigate through your tax documents. You can contact us via email, chat or call our hotline if you have any questions about the process. Our software also tells you in real time how much you can expect to get back as a refund, so you know if it's worth the one-time fee. Filing a year's tax return costs 24.95 euros once. You can make unlimited changes and re-submit free of charge. This fee is also tax-deductible. Most employees can submit their tax return for any past year from as early as January 1st of the following year. You can secure your refund for up to four past years. You may be required to submit an income tax return (e.g. because you had income in another country in the year of relocation) by 31.05. of the following year. The tax office usually takes four to ten weeks to pay the refund into your bank account. Why should I submit a tax return in Germany? Everything you need to know including information on deadlines, legal ways to maximize your tax refund, documents needed and how to go about filing your tax return. Various free online calculators for German taxes, e.g. calculating your expected tax refund or net income (after taxes and social contributions) and finding the optimum combination of tax classes for spouses.